If you are trying to build credit, you’re likely overwhelmed by all the information floating around the world wide web regarding credit scores. What’s worse, much of the data out there seems to contradict each other. This absolutely has a tendency of scaring people away from using credit, which can actually be detrimental in the long-term. Before we begin, you can easily look up your credit score with free services like Credit Sesame just to get an idea of where you stand. 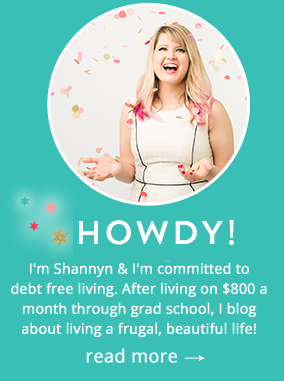 I promise, it’s easy & knowing your credit score is empowering! 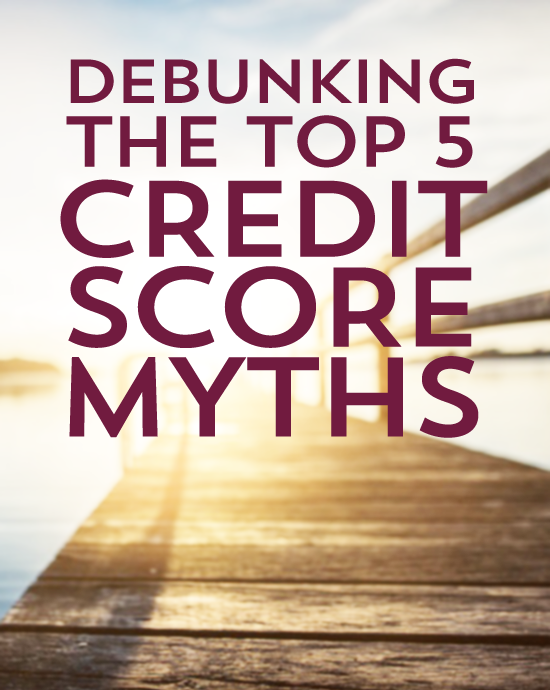 Below are the top 5 credit score myths, the knowledge of which I hope will help alleviate some of the anxiety surrounding your credit score! While having a cosigner is the most efficient way to establish or repair credit, it is not necessary to build a positive credit history. If you’re lacking in the cosigner department, consider applying for a secured credit card. A secured card requires you to put up a certain amount of cash as collateral. Your credit limit for that card is then limited to the amount you put down. You still must pay your bills every month; having the collateral on that card does not mean you can avoid making your payments. Eventually, you may be able to increase your credit limit, or sometimes a financial institution will add to your credit without requesting additional collateral as a reward for making payments on time. This myth is actually a half-truth. While paying off your debt is the number one way to improve your credit score, you should avoid closing your accounts, if at all possible. Closing these accounts, especially when you have debt elsewhere, makes the credit bureaus think that you have higher balances compared to your overall limits. In the same instance, having a large amount of credit cards doesn’t necessarily mean your score will be affected. Carrying large balances without paying them off is what will look bad to credit bureaus. Of course, if you pay off your debt in full every month, as I recommend, closing an account won’t matter as much or at all. Sorry, folks, but if you don’t use credit, the bureaus have no way of knowing if you are a responsible credit user. You need a background of credit usage in order to establish a positive history. Of course, if you abuse your credit, that’s just as bad – or worse – than not using any at all. So use your credit, not just cash, but do it responsibly. If you’re unsure of your credit score, you can check it for free with services like Credit Sesame which are free and secure- it’s wise to know where you stand before it’s an issue! I hate to tell you, but just because you paid off a delinquent loan or credit card, doesn’t mean that it gets removed from your history. While it does update the status to “paid,” the fact that you were late or delinquent can stay on your credit reports for up to 10 years. The same can be said for bankruptcy. That’s why it is so important to not get yourself in a bad credit situation in the first place. And before considering bankruptcy, it is important to try to consolidate your debts with the help from a qualified credit counselor. While I’m a huge advocate for limiting student loans as much as possible, because student loans are considered installment loans (much like a car or home equity loan), paying the monthly payment on time will actually reflect positively on you by the credit bureaus. Plus, student loans are a good way to establish credit for a young person without any previous history. If you need a student loan, make sure you take out the absolute minimum amount to get by. If you keep these 5 myths in mind when establishing and maintaining your credit, you will soon be on your way to a positive credit history. You’ve got this!